Do you know what to look for in a retractable awning? Retractable awnings or lateral arm awnings are self-supporting shading systems that are used for protection from the sun’s harmful rays. These units are mounted to a solid structure with no vertical supports and should not be used in severe weather (strong winds and rain). Retractable awnings are a lot like automobiles – there’s a large variety to choose from. From a distance, most cars appear to be similar – they all have fenders, doors, wheels, etc. Much of the value is unseen or unclear until it is pointed out to you. Price depends on what you want in terms of quality, comfort, durability, maintenance, options, and all the other goodies you can add to a car to make it just right for you. You get what you pay for. Retractable awnings are much the same way. There are many models to choose from, it just depends on what your individual needs are. Listed below are some of the features you should look for in a "quality" retractable awning as a long-term investment for your home. TORSION BAR: The purpose of the torsion bar is to absorb movement and flex from the complete system. All mechanical parts of the awning are attached to this "backbone" bar. Durasol offers the choice of a steel or aluminum torsion bar on their S4000 units. Typically, we would recommend the steel torsion bar for the high amount of energy absorbing load that they can handle. We’ve engineered our thick-walled aluminum bar for seashore areas where an added level of corrosion protection is desired. ROLLER TUBE: The roller tube is what the fabric is attached to and where the tension is provided on the fabric when the awning is extended out. Durasol incorporates steel roller tubes into their shading products. Steel roller tubes allow for 21’ wide by 10’ projections without the use of a center support. Aluminum roller tubes have much more deflection from the tension and weight of the fabric, which would require a center support at shorter widths and lesser projections than steel. Aluminum roller tubes may require the use of center supports for widths as small as 13’. RETRACTABLE LATERAL ARMS: The role of the lateral arms is to work in conjunction with the front bar and the roller tube to keep the fabric taut. The benefit of having lateral arms is that you can easily walk underneath the awning without having to walk around any side supports or poles. When comparing lateral arms, consumers typically take notice of the arm cables. Lateral arms usually come with either one steel cable or two. Durasol uses a single 4mm stainless steel cable constructed of 128-strand aircraft quality, 10,000 pound-test cables. Numerous awning companies will use two cables in their arms, but the two cables that they use are not 4mm. These companies rely on two 2mm cables to handle the stress needed to keep the fabric taut. Imagine trying to pull a tree stump out of the ground using pull chains and a truck. Would you prefer to use two smaller chains hoping that if one broke the other can support the weight load, or would you use a single heavy-duty chain? Hopefully you would use the heavy-duty chain to ensure you have a high-quality product to do the job effectively. 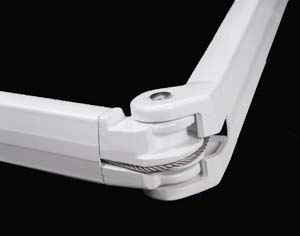 Arm cables work in the same manner; the larger arm cable can handle the weight load of the awning more efficiently. ARM SHOULDERS: Connection from the arm to the torsion bar is made with the arm shoulders. With arm shoulders, you want to have a minimum number of parts to avoid play and instability. When the shoulder is extruded, it consists of parts that are bolted together. Casted arm shoulders require a much greater investment in moulds and dyes, but they provide a "cleaner" look and a more stable awning that requires less "readjustment" after installation. INSTALLATION BRACKETS: These sturdy mounting brackets attach to the wood frame studs or masonry of your home. Durasol utilizes a bracket that can be mounted on both walls and soffits. To accommodate every type of mounting area, this bracket, combined with additional parts, can also be mounted on the roof of your home. If you have less then an 8’ clearance or desire a longer projection, we strongly recommend you consider a roof mounting application. The vacuum-injection cast molding of these brackets provides unsurpassed strength and durability. Over the years, we have recognized that customers may move or put an addition on to their homes, thus requiring the removal of their awning. The versatility of the installation brackets allows for the customers to have their local dealer re-install the awning on a different mounting surface or area. Many customers are happy to know that they can go from a wall mount to a soffit mount and vice versa, without the purchase of additional parts. FRONT BAR: The arms, fabric and valance are all connected to the front bar. The front bar is the outer most point of the projection. 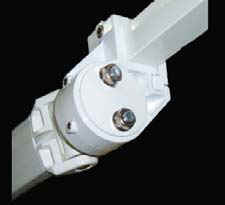 On lateral arm awnings, the fabric is only connected to the roller tube and the front bar. When the wind gets underneath the awning, the arms will bend or react to changing weather conditions, thus allowing the awning to billow up. All the stress of this billowing is transferred to the connection on the roller tube and front bar. Durasol uses a four-chambered front bar that has been unmatched in its quality to prevent sagging, bowing and deflection. There are items you can buy to lock down the front bar, such as legs and poles; however, keep in mind that most awning manufacturer’s warranties are void if you utilize such a product. Remember, a lateral arm awning is designed to have the fabric billow up and the arms fold inward during wind. This eliminates stress on the wall and the rest of the system. When the wind dies down, the arm extends back out using the fabric as a cushion. PROTECTIVE HOOD: Retractable awnings are self-storing when retracted, but, the need for additional protection may be required depending on the mounting area. The majority of units we sell will require a protective hood if the unit will be roof mounted or mounted on a wall that does not have an overhang or soffit in close proximity. The hood may also be utilized to protect the unit from snow or any other type of harsh weather when the awning is not in use. A hood will also keep the fabric cleaner and help to protect the enclosed motor from the elements. ELECTRONIC OPTIONS: Many people question the option of whether or not to motorize their awning. 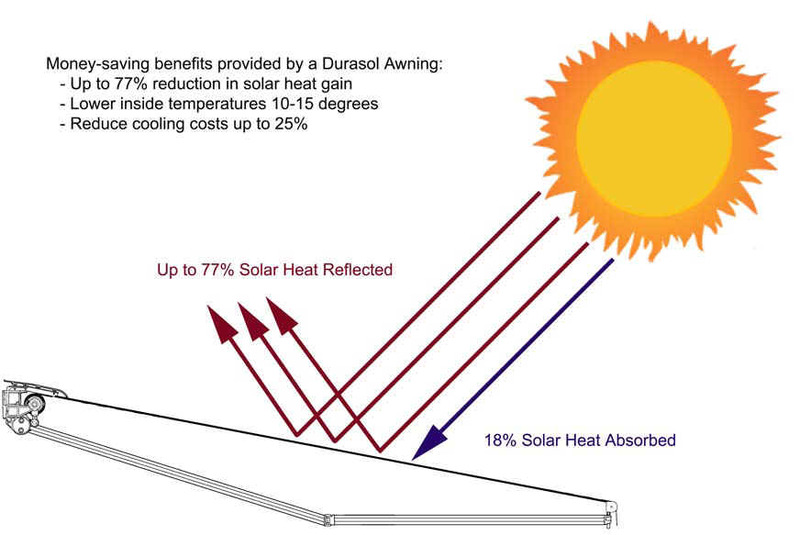 Over 85% of the awnings that Durasol produces are motorized. The average time it takes to extend a motorized awning is about 20 seconds, using a hand crank can take up to 2 minutes. By simply pushing a button, you can save considerable time and effort, as well as avoid possible unit damage associated with rolling it up wrong or extending it too far. Another thing to consider about motorized awnings is the various electronic options that can further suit your needs. Durasol offers an assortment of electronic options including remote controls, indoor and outdoor switches, and weather sensors. them an ideal candidate for lateral arm awnings. With changing weather conditions, vinyl covers will heat up and stretch, affecting the performance and factory settings of your awning – not to mention the smell of the plasticizes leaching out. Today’s acrylic fabrics are woven specifically for use on retractable awnings. This heavy-grade acrylic fabric provides protection from harmful UV rays, while allowing most of the sun’s energy to be deflected. Acrylic fabric on your lateral arm awning will allow the area under the awning, as well as the nearby indoor areas, to be much cooler. Acrylic fabric is woven, which it allows it to "breathe" and increase resistance from moisture and mildew. Durasol uses solution dyed acrylic fabrics from Sunbrella and Dickson – both woven by the world’s leading producer, Glen Raven Mills. Solution dyeing (adding color while still in a liquid state) locks the colors into the acrylic fibers. This process reduces fading and increases the aesthetics of the product, making each fiber much like a carrot – the same color all the way through. The second thing to consider is which color will work best. Durasol offers over 200 designer colors and patterns to choose from. Many consumers wonder if they should choose a dark or light color fabric. Dark color fabrics will provide anywhere from 95-98% UV protection, while light color fabrics will resist 94-96% of these rays. If you are considering an awning to conserve energy, then lighter color fabrics are your best choice. Please keep in mind that the lighter the fabric, the more dirt will typically show over time, which may require periodic cleaning. INSTALLATION: You can purchase various systems from many dealers in your area. The only place you can purchase a Durasol awning is from your local Durasol dealer. Durasol dealers are factory trained and will ensure that your awning is professionally installed and serviced. Consider that a 200+ pound awning will be mounted directly over the heads of your family. Do you want to risk having an installation failure? Why not leave your installation to the professionals – it’s money well spent. Our dealers are selected to provide you with peace-of-mind – knowing you have chosen a quality local company that stands behind their work and can provide references on request. A LAST WORD: Durasol awnings are not the least expensive, nor are they the most expensive. They are, however, the best-engineered and designed system for a retractable lateral arm awning today. Durasol is one of the few, if not the only, awning manufacturer that is not concerned with how many dealers carry their product line, but rather are more concerned with the quality of the dealers that they partner with. Not everyone can be a Durasol dealer – only the best will do. That’s why we have over a 98% nation-wide customer satisfaction rate. Your investment in a quality long-term shading product, installed by professionals, will prove to be a decision that you and your family will enjoy for years to come. We back your purchase with a factory-registered warranty, something unheard of in the industry.